Our news desk will publish interesting articles about Cirrus Laser, it's projects and clients. London based, American artist commissions Cirrus Laser to produce the sculpture for the Lily Lane Primary School in the North West of England. Randy Klein was approached to complete a makeover of the outdoor space led by Julia Clark, a visionary Headteacher of Lily Lane Primary School in Manchester. The project involved including the winning entries of a competition for the pupils to form the basis of final designs. There is so much the school wanted to achieve including a brand new entrance and fence. "The new gate will provide a clear entrance to the early years area, and a new main entrance will rationalise flow as well as provide an exciting new identity for the school" said Klein. The details were all created by children at the school and I created the overall design. The artwork had to be done as strong contour drawings, to enable them to be used for laser cutting metal. The drawings were laser cut in steel by Sussex based Cirrus Laser and welded in place. But most importantly, the children should recognise their own artwork in the finished gate. Below you will see the finished artwork into place. The garden tool to help all! 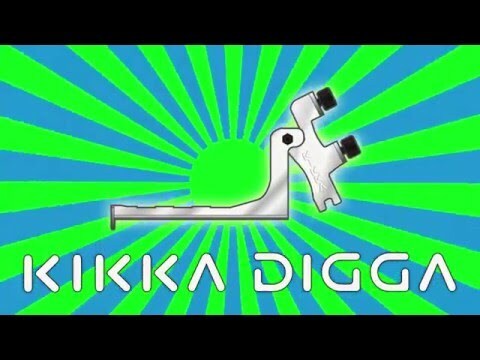 Kikka Digga is a universal digging attachment tool, it provides a footplate/ pivot and clamps on to all standard digging forks and spades making digging easy therefore saving time - and your back! Two years ago we met Nick Skaliotis, the inventor of Kikka Digga, at a trade show, and now the item is live! Finally, after months in the planning and preparation, the Kikka Digga project is ready for the market! In brief, it is a device to help gardeners save fatigue as well as aiding those with back and spine injuries. The video below helps to describe the tool. Nick said "I found Cirrus Laser to be flexible and co-operating in the difficult and intricate nature of taking an early prototype idea from a simple 'garden shed invention' to a professional market-ready product. Dave Connaway's input into keeping my ideas within the parameters of manufacturing limitations, working within; or around them have contributed to bringing Kikka Digga to where it is - and where it's going." Watch this space for more news in the coming months about Kikka Digga and other clients projects. © 2019 Cirrus Laser Ltd.